Description: MILW West Line train 2215 arrives at the station. Description: MILW West Line train 2215 Prepares to head west to Elgin. 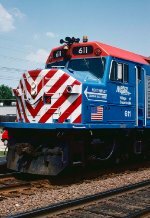 Description: Metra 611 lays over in the yard at Fox Lake, Ill., on April 10, 2004. Description: Metra Milwaukee District West Line train #2718 is about to duck under U.S. Route 20 as it rolls out of Elgin on its way to Chicago. 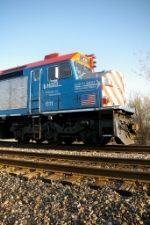 Description: Led by F40C 611, Metra Milwaukee District West Line train #2233 speeds west through Wood Dale. Description: One of the last two F40C's in revenue service, Metra 611 eases Milwaukee District West Line train #2711 to a stop at Bensenville. Description: East into the city, back when they ran on a regular basis. 611 and 614 are still around, as anybody will tell you, but they don't run much. Description: Although the failure of five MP36 locomotives forced Metra's last two F40C's back into service, the F40C's were not needed for Sunday service and 611 is seen here in the Fox Lake yard. Description: My first operating F40C pulls up to the Glen at North Glenview station. It was pulled out of retirement for a day for this engineer to make his last run before his own retirement. Description: 611 and her retiring engineer pull out of North Glenview station, headed for Northbrook. Description: 611 and 419 now push their trainset back towards Chicago after flipping back at Deerfield. Description: 611 pushes its train eastbound (southbound) towards Chicago while a northbound Hiawatha stops to load passengers. 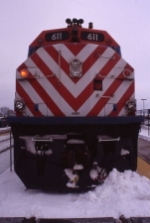 Description: 611 returns again on a later northbound trip to Grayslake at 6:51PM. He didn't pull as far up this time so I couldn't get a side-on shot to avoid the headlight glare. Description: 611 and 419 depart from me for the last time of the night, headed to Grayslake. Their exhaust reveals the signal beam. Chris stands closer to the signals for his shot.